I’ve had a LOT of requests for a Vegan Chicken Pot Pie recipe this weekend, so here it is! Of course it’s next to impossible to recreate Mom’s flaky pie crust without using shortening, butter, or some kind of fat…..so I decided to use my homemade biscuits instead. Not quite the same…..but trust me – it still tastes delicious! My wife even went back for seconds! I know there’s a LOT of comfort foods we’ve had to give up since becoming Plant-Based, and Chicken Pot Pie probably ranks right up there near the top of the list…. 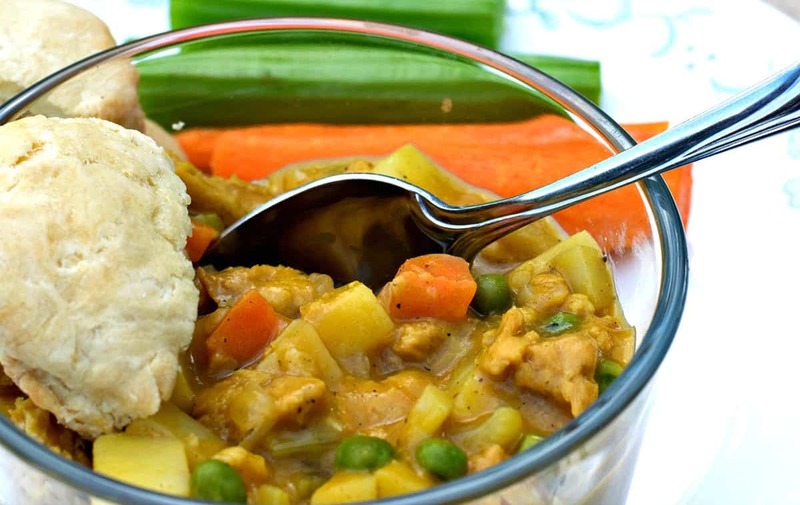 But with THIS Vegan Chicken Pot Pie Recipe – you can still get your pot pie fix, without worrying about tons of oil or fat. All it takes is a few veggies, some low sodium veg broth, and a bag of Soy Curls. Butler Soy Curls are whole, non-gmo soybeans that have been cooked, shredded, and then dried. When you rehydrate them in water (or broth) they take on an un-canny resemblance to the texture of chicken. I’ll include a link to Amazon where you can find them, and they are also available from the Butler Foods website as well as Whole Foods. Here is the LINK to Amazon. Note: This IS an affiliate link, meaning I will receive a small commission for every purchase you make on Amazon. Thank you. It’s about helping YOU make that transition from a Standard American Diet to a Whole Food Plant Based diet, as easy as I can. I’ve received hundreds of comments from happy wives, telling me that my recipes have helped their meat-eating husbands make the switch, where nothing else has before. They love my food, because they don’t feel like they’re giving up anything. Same comfort food taste, without all the artery clogging fat, oil, or animal parts. And their health is improving because of it! Let me begin by saying, this is NOT a quick recipe, it will take some time. And….if you are going to use my Biscuits as a topping, you DO need to have about ½ cup of This Amazing Vegan Cheese Sauce already prepared in order to do that. First were going to add 1 cup low sodium vegetable broth, 2 Tbs of low sodium Soy Sauce, and ½ tsp of Poultry Seasoning to a medium sized bowl and whisk to combine. Then add about ½ of an 8oz bag of Soy Curls (about 2 cups) and stir them in. Set this aside while we prepare the veggies. The soy curls will soak up all the marinade, so be sure and give them a stir once in awhile until we’re ready for them. Now chop 2 carrots, 2 celery stalks, and ½ of a white onion. Throw the veggies in a large soup pan and sauté over med-low heat with ½ cup of low sodium vegetable broth … just until they begin to soften. Next we’re going to dice 2 Yukon Gold Potatoes and add them to the mix, along with about ½ tsp of chopped garlic. Season with ¼ tsp each – Thyme, Salt, Ground Pepper, and Turmeric. I also tossed in just a pinch of Rubbed Sage. Stir in the spices and then the soy curls you set aside earlier, and then slowly sprinkle ¼ cup of AP flour (White or Wheat) into the mix and give that a good stir. Let it cook for a minute or two and then stir in 2½ cups of Low Sodium Veg Broth. Increase the heat and let it come to a low boil, it should start to thicken. If not, you can add a slurry of 1 Tbs water to 1 Tbs Corn Starch and whisk that in, that should thicken it too. Let it cook for a minute or two (or until it reaches the consistency you like) and then turn off the heat. Stir in 1/3 cup fresh or frozen peas to finish it off. Pour the filling (stew) into a 2 quart baking dish and top with biscuit rounds from my Fluffy Vegan Buttermilk Biscuit Recipe (you can find it by clicking here). Bake in a 375° oven for 25-30 minutes, or until the biscuit topping has browned. 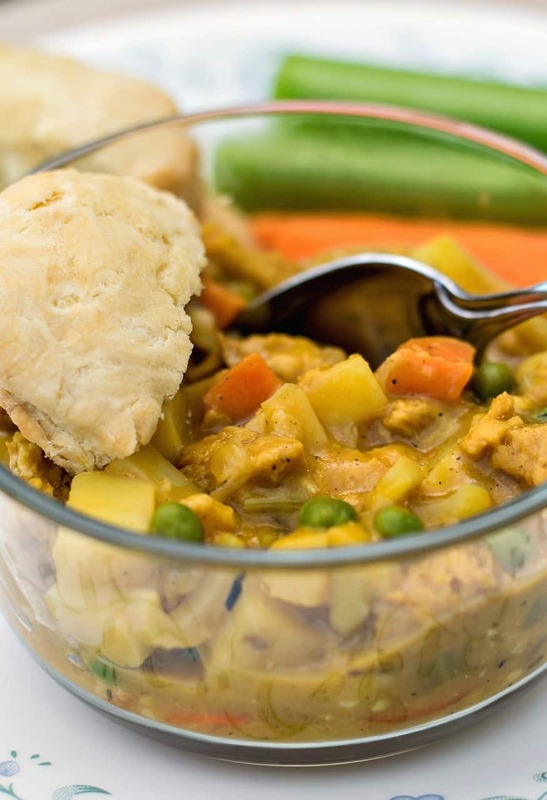 Mmm…Vegan Chicken Pot Pie….just like mama used to make (….er….sort of). 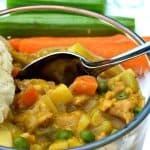 A Vegan Chicken Pot Pie Recipe using fresh veggies, a savory broth, and the chewy goodness of Butler Soy Curls. Chop carrots, celery, and onion and add to a large soup pan. Sauté in 1/2 cup broth until softened. Dice potatoes and add to pan along with garlic, and stir to combine. Cook for another minute. Add Thyme, Salt, Pepper, Turmeric, and Sage and stir well. Add the Soy Curls you set aside earlier, and stir to combine. Sprinkle flour into stew and stir. Continue cooking for 1 minute. Slowly stir in 2 1/2 cups Veg Broth and increase heat to a low boil. It should begin to thicken. If not, whisk in a slurry of 1 Tbs Water & 1 Tbs Corn Starch and stir until it thickens. If eating as a stew, let rest for 5-10 minutes and serve. If using biscuit topping, preheat oven to 375 degrees and prepare biscuit dough using the following recipe. Arrange biscuit rounds on top of filling and bake for 25-30 minutes or until biscuits are browned. Note: If using my Fluffy Vegan Buttermilk Biscuits for a topping, you WILL need to already have some of my Cheese Sauce prepared (about 1/2 cup). If not, you can STILL enjoy this as a stew either served alone, with some crusty bread for dipping, or over rice. Keep on posting!! 😁 My hubby for sure thinks this is more “normal” food that he can accept and enjoy. Thanks! I’m making this now and I cooked the biscuits. Was I supposed to cook the biscuits on top of the stew, not separate ? You can do it either way…..in the recipe I say to prepare your biscuit dough and arrange on top of the stew before baking an additional 30 minutes, but if you’ve already made the biscuits….just arrange on top and serve. This is great. Get rave reviews from everyone who tries it.